osu!Post - Live osu! status for your signatures · forums · community | osu! or did't show Online when I running osu! Not sure about the "Failed to show preview image!" error part, but the other thing has been answered quite a few times within the last few pages. The original osu!Post program won't show you being online. Please use osu!StreamCompanion with it's osu!Post integration for now. Since the preview image isn't needed in osu!SC, that should be irrelevant as well. But if you're still having trouble after setting that up, feel free to post back here again and I'll see if I (or someone else if they want to) can help. There might be a few downtimes within the next weeks, as I am about to change a few things. Those won't be really long, I doubt anybody will notice them, but they might happen. I didn't work on it that much recently, but I got asked quite a few times about the source, especially the MSN Integration part. If you are also interested in that and also want to build applications like that, feel free to PM me, I'll give you the lastest code. I got a beta build ready, but its still far from release and I doubt I will work on it again soon, as I think osu!SC is doing an amazing job. It has also already been tested a bit, I just need to convert the old userdata/custom stuff to the new structure and finish up/clean up some important parts. As for osu!SC users, don't worry, it will be compatible without the need to update it. But to be honest, I am still quite unhappy with the custom image creation, but I decided to upload it within the next weeks anyways and rework it after that. The now upcoming custom image creation is still a bit wonky at some parts, but its working. I am aware that its mostly annoying to upload the images and the features are not quite explained well, atleast I feel that way. Possible downtimes soonish due to new Website and Backend structure, Application on hold, future plans for way easier custom images (again, again). The design (Website) will be updated as well, but don't expect too much, I rather spend the time finishing up the code right now. Sorry for the double post, but I just ment to bump this as I just pushed the new system live. I converted all the styles/images and data to the new system. It appears a few old signatures couldn't correctly be converted, mainly the [Online] / [Offline] parts, this is due to the new Left/Right/Center options. Left: The text STARTS at x. Right: The text ENDS at x. Center: The text MIDDLE is at x.
I'll try to include the documentation and some improvements to the customization soon, if you happen to notice something broken, feel free to pm me or post it here. Again, the customization is only a placeholder right now, until the new more userfriendly one is ready. this is so cool, nice for u to do it. This is really awesome! Small bug, though: The & character in a beatmap name seems to cut off the text. Try it with the map XY&Z. Hello, seems like the data send is not correctly encoded. I assume you are using osu!StreamCompanion? I looked through the source there and found the problem, will suggest a fix later on. You're welcome. Also, I think there should be a template to match the osu! signature's "In-game panel - Status version" style. It only makes sense, after all. And to go along with it, more statuses (like modding and multiplaying) should be able to detected. RAM watching would probably be required for some statuses, though, but that'd also help with osu!StreamCompanion confusing the "nekodex - circles!" menu theme with the map of the same. Sorry for the late reply, strange, it works fine for me on the "new" subdomain, might be browser related? Will check it out in some browsers later on. As for new templates, I am still working on the new osu!Post site, there will be templates and multiple custom signatures to create. So there won't be new ones on the old service, but the new one will deliver. There will be quite a lot of changes such as custom text on the signature, similar as in osu!StreamCompanion text output, I am still figuring out how to best convert the old signatures to the new format. But more about that later, I'll post some screenshots/webms/gifs of the creation at some point when its more polished. As promised a short preview for the new signature creation. As in my other post about osu!Rank I'll just say a few words in the beginning here. I started this project to relax a little and try something new in a programming language I haven't used that much before, Delphi. Thanks to Primula's application osu!np, I've had a nice idea for a "new" project I can have some fun with. As I worked on it, more and more ideas kept coming and I started to write a little neat backend as well, an upload host for live status signatures, that works hand in hand with osu!Post. After beta testing it with some friends, I thought it might could be usefull, so I created this post, this is basically it. I plan to also accept osu!np data at some point, as I got the basic idea for everything from him. So if you want to post your status and do many other awesome things, you should totally try his application. osu!Post basically works the same the only difference is that it's focused on sending "post requests" to php scripts. To get back on track, I am not sure if people need this, nevertheless, feel free to test it and play with it! We'll see what will happen. Using MSN Live status integration. Why? - You'll need this to track your osu! status and send it to the website. Why? - Because the website will look for an osu! user with the name entered. Why? - This is done so I can be sure that you are no one else, hope it's not a bother. Why? - You'll need it to send data to the website or to log in here, you can also change the key there. Why? - Well, to get it started and that's basically it, you are good to go now. Why? - This is due to this change: [peppy] Don't set window title when running osu! fullscreen. Still problems? Update .net Framework! Why? - Microsoft says so and its always a good thing to have it up-to-date. The little application running in the background! Please keep in mind that the creators of osu! have nothing to do with this. They can not be hold responsible for flaws or damage to the system. You can't launch osu!Post more than once at a time, you'll get a message if you try to do so. 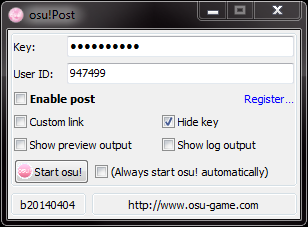 osu!Post will be in your tray, right clicking it will open a context menu with several options, as launching the game. If osu!Post isn't able to send the data, for example on a disconnect, it will retry every 30 seconds. osu!Post is reading the game path out of the registry. osu!Post is careful when reading from the .db file and is not setting any locks at all, so it won't fight with osu!. osu!Post will frequently check the osu!.db file for changes and reload it only if neccesary, if it fails to read however, osu!Post will retry to do so. If there is no file present or the data cannot be parsed, as for format changes, osu!Post will cancel the reading. The configuration of the application is saved when gracefully closing it or every 45 minutes. The data will be sent whenever your status changes. There won't be any data sent if osu! is not running on startup. The status "Offline" will only be sent when your last sent status is "Online". This won't happen when you are already "Offline" as in osu! is closed but osu!Post is still running. isOnline => Boolean: "true" or "false"
mapName => String: "Artist - Mapname [Diff]" or "NoMap"
Your generated key goes here, more about the key itself is further down in the website documentation. The key can be "hidden" with the Hide Key checkbox mentioned further down. The key is sent as an additional identifier. This field contains your osu! user ID. If you want to use to osu!Post signature service, just put your ID here. All the data sent there will be sent via "post request", the only exception is your ID, which will be sent via "get". Used if you don't want to use the osu!Post server! This field contains the address where the data should be sent to. All the data sent there will be sent via "post request". This input is hidden by default, it can be made visible by checking Show preview output. You can optionally enter your custom signature link here to see if it's working correctly when sending data. This will check if osu! is running and send data everytime the status changes. Where the data is sent, is depending on the status of Custom link, more about it below. The "Status offline" will only be sent when you uncheck it and the status was "Online" before. This allows you to enter your own, custom, address. You can use this if you got a server and script on your own, for example. Checking this will hide your key, making it unreadable, you can check and uncheck this at any time. This is only a visual security option. This will show a preview of your signature inside the application, if "Custom Link" is activated, you'll have enter the link manually. The image will be updated everytime a status is sent and Show preview ouput is checked. Checking this will show the log where everything that has been sent or done by the application can be seen. Checking this will launch the game when starting osu!Post. osu!Post basically becomes a launcher and runs in the background. This option is recommended to be used while having Enable post checked. It's used for easier handling without having to care about other applications than osu! itself. If osu! is not running, this button will start the game. This button will refresh the Preview image.